Lung TCD8 impairment is cell-intrinsically regulated by PD-1. (A–C) WT (Thy1.1+):PD-1−/− (Thy1.2+) mixed bone marrow chimeric mice were checked for immune reconstitution in the blood before and in the lung after HMPV infection. (A) A representative flow cytometry plot gated on live/CD19−/CD3+/CD8+ lymphocytes is shown. In the graph, each symbol represents an individual mouse and the horizontal bar indicates the mean. Ratios of WT:PD-1−/− TCD8 in preinfection blood (▪) and postinfection lungs (○) sum to 100%. (B) Mixed bone marrow chimeric mice were infected with HMPV and the lung F528- and N11-specific TCD8 responses were quantified via tetramer staining (black bars), CD107a mobilization (gray bars), and intracellular IFN-γ production (white bars) at day 7 p.i. Data are combined from three independent experiments with four to five mice per experiment. (C) The percentage of functional HMPV-specific TCD8 was calculated by dividing the percentage that degranulated or made IFN-γ by the percentage that stained tetramer+. Lines connect data points from WT and PD-1−/− TCD8 within the same mouse. Data are representative of one out of three independent experiments with five mice per experiment. *p < 0.05, **p < 0.01, ***p < 0.001, unpaired t test; †p < 0.05, paired t test. Isolation of epitope-specific lung and spleen TCD8 and comparison of gene expression. (A) Time course of HMPV M195-specific TCD8 functionality (IFN-γ production) in the lung and the spleen. (B) Pre- and postsort analysis of lung M195-specific TCD8 at day 7 p.i. (C) Total number of genes differentially expressed for the indicated M195-specific TCD8 populations compared with naive TCD8. Naive spleen TCD8, spleen M195-specific TCD8, lung M195-specific TCD8, and 2° lung M195-specific TCD8 are shown. Genes were considered significantly different when the fold-change was >2 and the FDR was <10%. 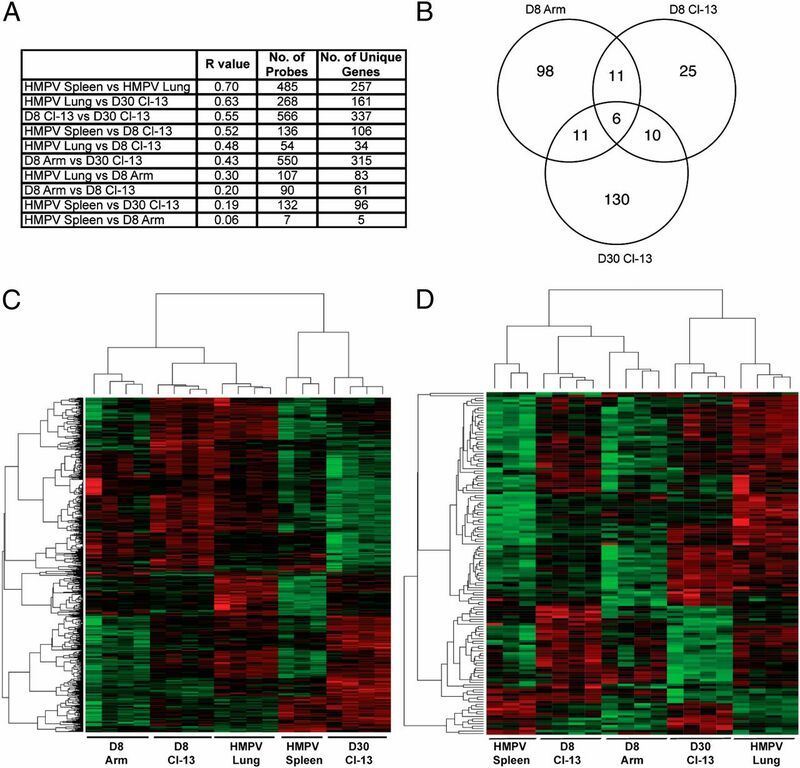 Lung TCD8 differentially regulate numerous immune-related genes compared with spleen TCD8. 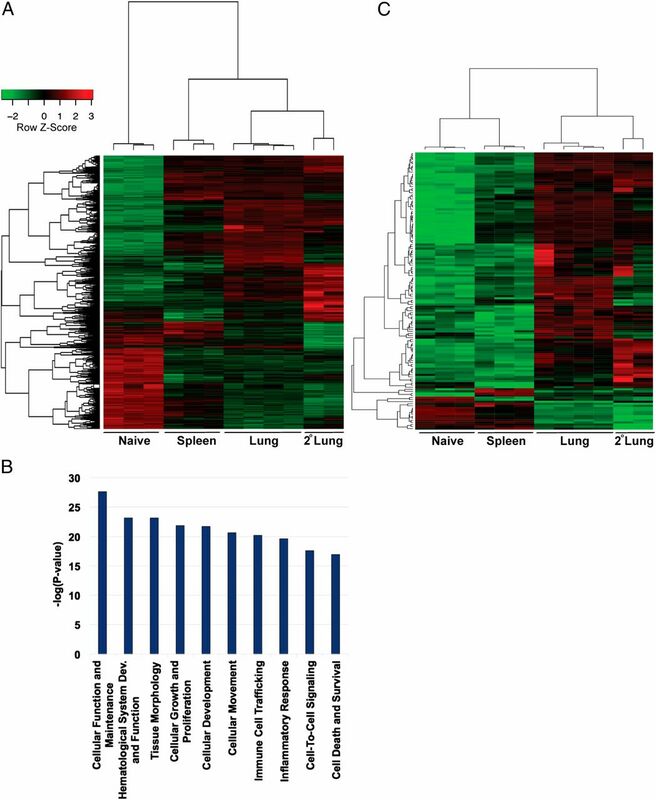 (A) Heat map of ANOVA analysis of the gene expression profiles of naive TCD8 as well as spleen, lung, and secondary lung (2° lung) M195-specific TCD8. Each row represents a unique gene whereas each column is an individual sample. (B) Enrichment of gene ontology categories (biological processes) for genes differentially expressed in the lung versus the spleen. The top 10 categories are shown. (C) Immunity-related genes were identified using Ingenuity Pathway Analysis and are displayed in a heat map comparing all four groups. Genes were considered significantly different when the fold-change was >2 and the FDR was <10%. Lung TCD8 possess an exhaustion-like gene expression profile. Lung and spleen M195-specific TCD8 gene expression was directly compared with that of spleen gp33-specific TCD8 during acute (Arm) or chronic (Cl-13) LCMV infection (data from Doering et al. in Ref. 30). LCMV samples include early acute (day 8 [D8] Arm), early chronic (D8 Cl-13), and late chronic (day 30 [D30] Cl-13). Batch effect was compensated for before further analysis. Genes were considered significantly different when the fold change was >2 and the FDR was <10%. (A) Pairwise comparisons were made based on the coefficient of variation. The total number of probes, genes, and unique genes plus corresponding similarity score (R value) are shown. (B) In a separate analysis, all groups were compared using ANOVA, and the total number of genes found differentially expressed for the indicated anti-LCMV TCD8 populations compared with lung M195-specific TCD8 is shown. (C) Heat map resulting from the analysis in (B) shows the gene expression profiles of each TCD8 population. (D) Immune genes were identified using Ingenuity Pathway Analysis and are displayed in a heat map for each group of anti-HMPV or -LCMV TCD8. Lung TCD8 coexpress numerous inhibitory receptors. (A) Multiparameter flow cytometry was used to quantify expression of the inhibitory receptors PD-1, TIM-3, LAG-3, and 2B4 on M195-specific lung and spleen TCD8 at day 7 after HMPV infection. Numbers indicate percentage tetramer+ TCD8 expressing the receptor in the lung or spleen. Representative flow plots are shown. (B) Boolean gating analysis for the coexpression of inhibitory receptors on M195-specific TCD8 at day 7 p.i. The number of receptors expressed by lung and spleen TCD8 is shown. Data are representative of one out of independent experiments. Cognate Ag is required for lung TCD8 impairment. (A) Experimental design: mice were immunized i.n. with A34R-loaded DCs and challenged 7 d later with HMPV. During infection, mice were given either cognate (A34R) or mock (irrelevant HLA-B7–restricted epitope) peptide i.n. daily. Lung TCD8 response was quantified at day 7 p.i. (B) Weight loss during HMPV infection of DC-immunized, peptide-treated mice. (C) Tetramer staining and ICS for the A34R and M195 TCD8 epitopes at day 7 p.i. The percentage of tetramer+/IFN-γ+/CD107a+ (left), functional epitope-specific TCD8 (middle), and the total number of tetramer+ TCD8 (right) were calculated. For each bar, the epitope analyzed is given with the treatment directly below. 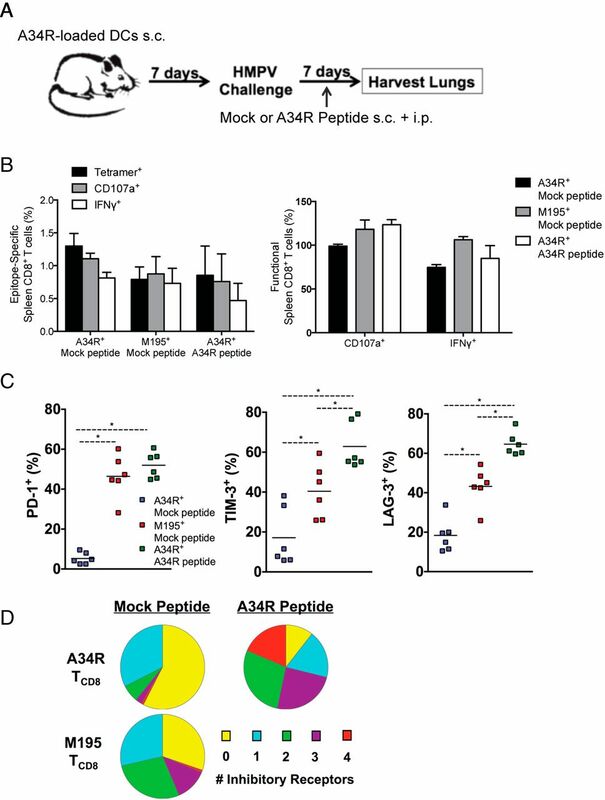 A34R+ and M195+ TCD8 responses in mock-treated mice are from the same infected animals. Results are combined from three independent experiments with five mice per group. *p < 0.05, ***p < 0.001, unpaired t test. Viral Ag mediates lung TCD8 inhibitory receptor expression. Mice were immunized and treated as in Fig. 6. (A) Inhibitory receptor expression on A34R- and M195-specific TCD8 is shown. Each symbol represents an individual mouse. Horizontal line denotes the mean. (B) Inhibitory receptor coexpression was determined for both epitopes via Boolean gating. Data are displayed as a pie chart. Results are combined from three independent experiments with five mice per group. *p < 0.05, unpaired t test. Viral Ag-mediated TCD8 functional impairment does not occur in the spleen following systemic immunization and HMPV infection. (A) Experimental design: mice were immunized s.c. with A34R-loaded DCs and challenged 7 d later with HMPV. During infection, mice were injected with 50 μg either cognate (A34R) or mock (irrelevant HLA-B7–restricted epitope) peptide s.c. and i.p. daily. Spleen A34R- and M195-specific TCD8 responses were quantified at day 7 p.i. (B) The percentage of functional epitope-specific TCD8 was calculated based on tetramer staining and ICS. For each bar, the epitope analyzed is given with the treatment listed directly below. Results are combined from two independent experiments with five mice per group. (C) Inhibitory receptor expression on A34R- and M195-specific TCD8 is shown. Each symbol represents an individual mouse. Horizontal line denotes the mean. Data are representative of two independent experiments. (D) Inhibitory receptor coexpression was determined using Boolean gating. Results are combined from two independent experiments with five mice per group. *p < 0.05, unpaired t test. Green indicates downregulated; red indicates upregulated.